At long last! The living room tour! I know you've all been dying for it. Ahem. Or something like that. Anyway, to all my new readers and followers, (thank you for following, by the way. you make my day!) I know there has not been a lot of new content around here. I've been pretty busy with the wee one and most of my blogging is taking place over at my other blog. There are so many moments I want to remember in these first few weeks. You can head over there if you want to see the other side of our life. But first, hang out here long enough to see our living room. It's a pretty fun spot. Have I told you that we lived in a 600 square foot house for 8 years? It was more of a cottage, really. Or a shack with charm. But what it was mostly was tiny. In our living room we had room for a couch and that was about it. A small couch at that. So when we bought this house and finally had a real living room, it was really, really fun to decorate. To our little couch, we added a coffee table and 2 orange arm chairs. I have dreamt of a coffee table for years! They're vintage. No surprise, right? Everything else is vintage, garage saled, or gifts to us. The arm chairs were in the first season of Mad Men. I've never seen the show, but maybe you remember them. I was not real sure about them at first, but Aaron convinced me. 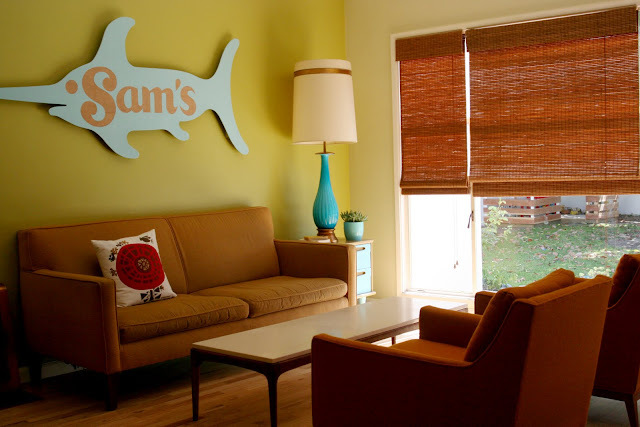 That turquoise lamp we found at a garage sale. It was the first thing we bought for our new living room. Some people have said, when they first walk into our living room, "wow. That's a big lamp." Not sure that's a compliment. But, whatever. Our wall unit is from Amsterdam Modern. They have beautiful furniture. Check out their site. They buy vintage furniture from Holland and ship it here. We waited a while to find just the right piece, for the right price, to fill that big wall. There is still a lot of empty space on those shelves, but we're filling them as we find the right things. The trailer painting is by Aaron. Not everyone has a huge painting of a trailer in their living room. But not everyone has a giant swordfish hanging in their living room either. I guess we're different that way. 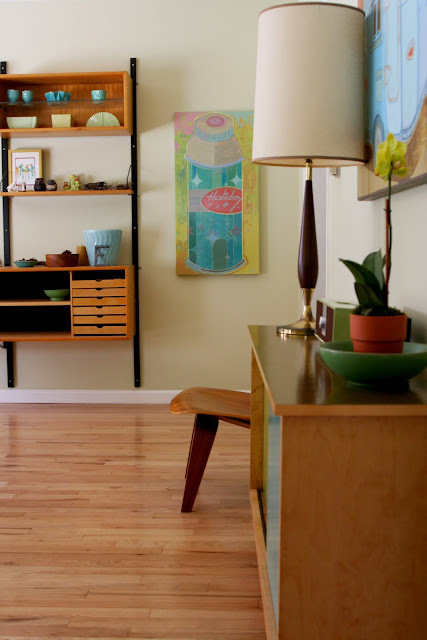 That Eames chair was the first "grown up", designer piece of furniture we bought as a married couple. We love the shape of it, the wood and also, it fit perfectly in our tiny house. Those were the days when we could splurge on a chair like that for a Christmas gift to each other. But we'll have it forever. One of my favorite pieces in the living room is the credenza. Aaron designed it to fit exactly in the one open space in the living room of our first tiny house. He drew the legs and had them made by someone in Oklahoma who custom makes hairpin legs. 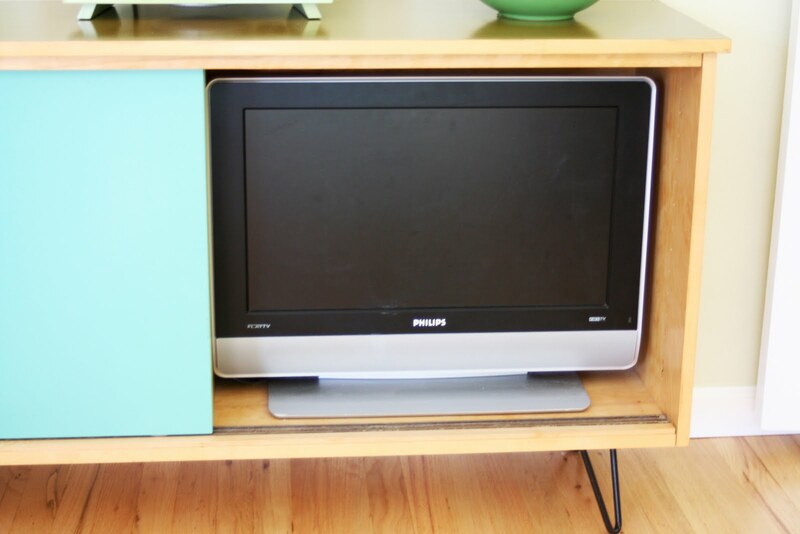 He drew up the plans to the inch to fit our tv inside so we could hide it away when we're not watching it. Since tv is not important to us at all, we were more interested in hiding it than putting it on the wall. The other side of the cabinet holds our movies. Mostly Seinfeld and the Office. We have to watch them on dvd because we get no tv channels. 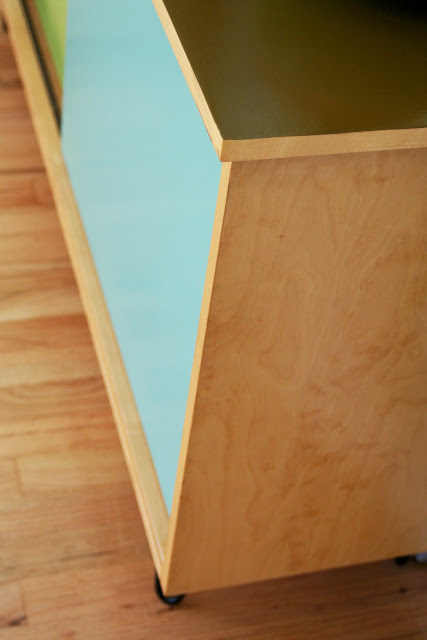 Using Aaron's design, a cabinet maker friend built it for us. He left it unfinished and Aaron attached the legs and then gave it its custom paint job. I think my man is amazing. Besides the furniture you place in your home, it is really all the other things you fill your rooms with that tell your story. Here are some of the things that fill our living room. In addition to loving cuckoo clocks, I love other clocks too. 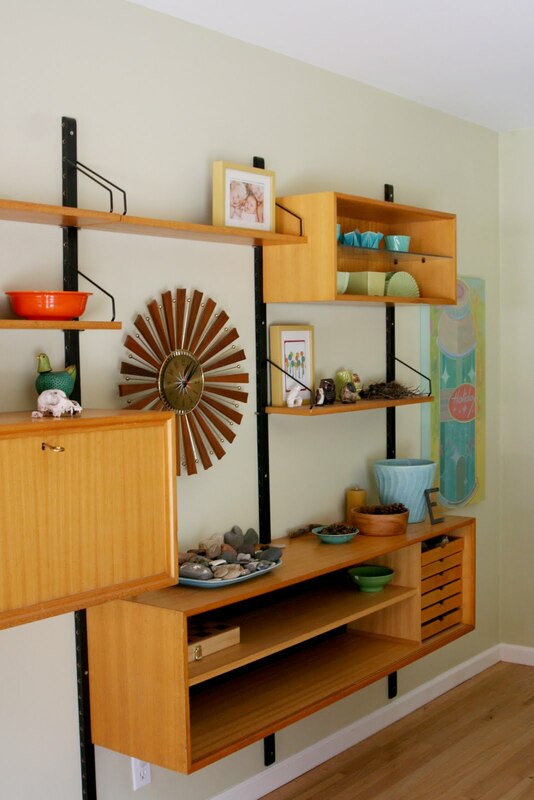 That one hanging in the wall unit was a gift. It fits so perfectly there, don't you think? We use our wall unit as our nature table. It is full of the things we find on our hikes and adventures in the great outdoors: pine cones, acorns, beautiful shells and birds nests. 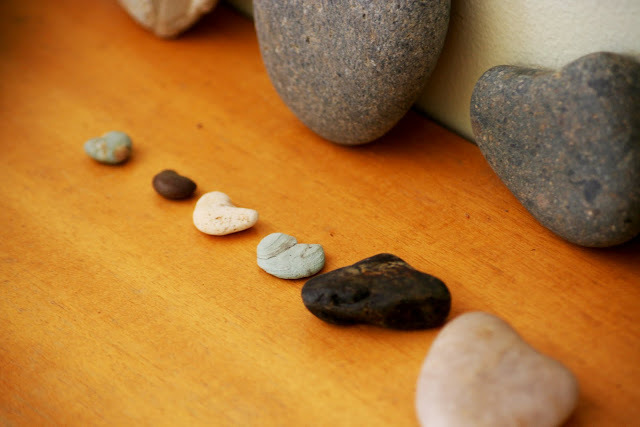 There are lots of the heart shaped rocks my son William finds for me on every trip we take to the beach. And yes, even the skulls he finds. My kids love finding and identifying bones while we're on the trail. 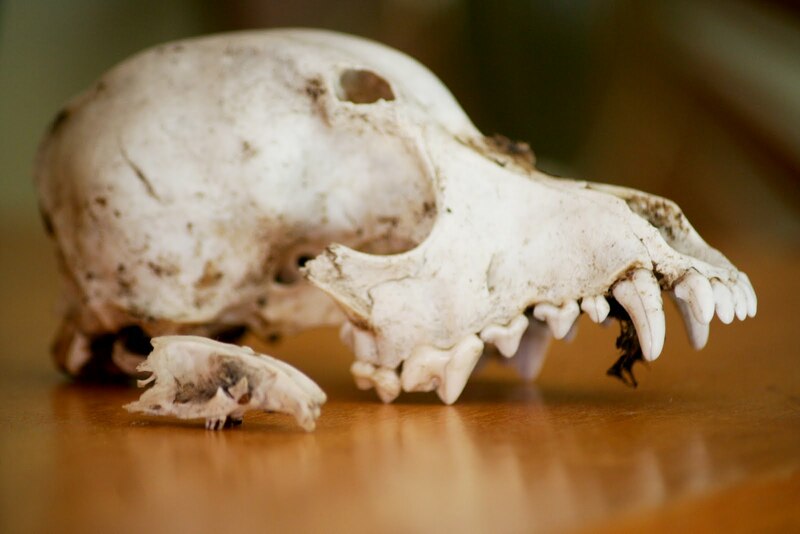 To find a full skull is considered a treasure. To be honest, that big one is still staying outside until it gets cleaned off better. But it will be inside soon. William wants to display it. And I'll let home because I'm nice like that. 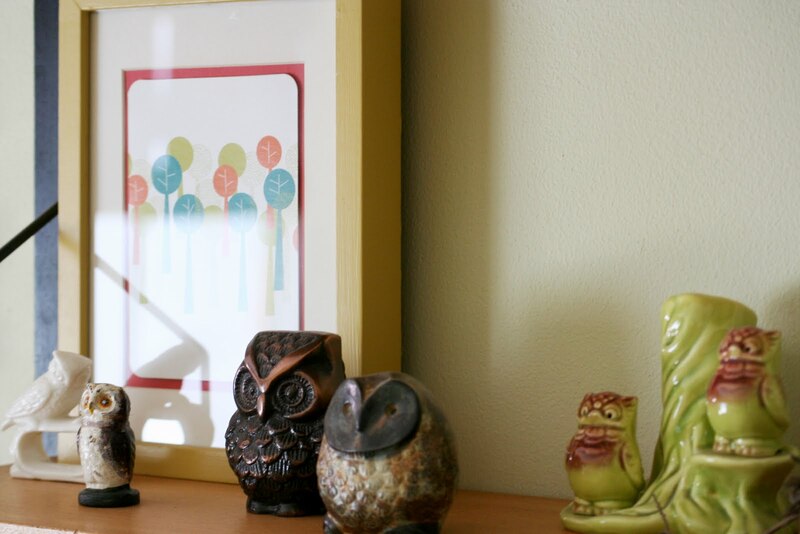 In addition to the bird collection, I also like owls. I found him at an estate sale. He's made of vinyl and opens up. We keep a blanket inside for cuddling on the couch and reading a book or watching Seinfeld dvds. I really like the shape of the legs. 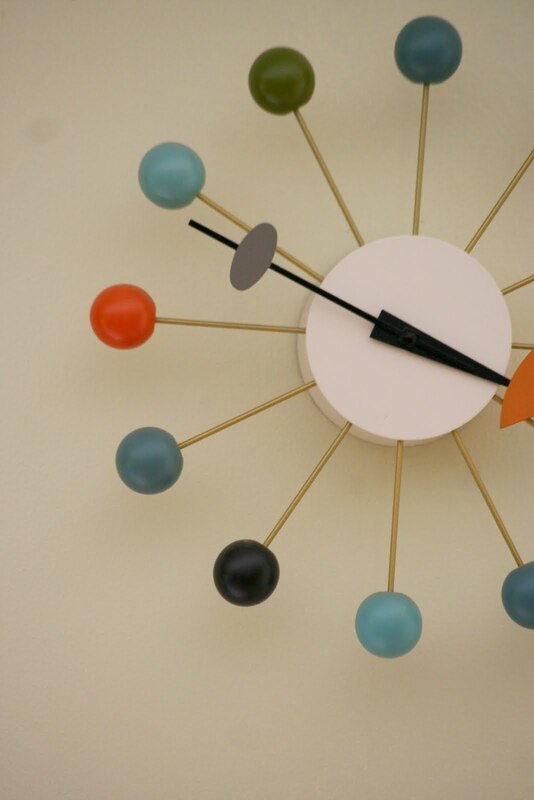 Another clock in some of our favorite colors. This one was a gift from Aaron's mom and dad. It's another favorite. 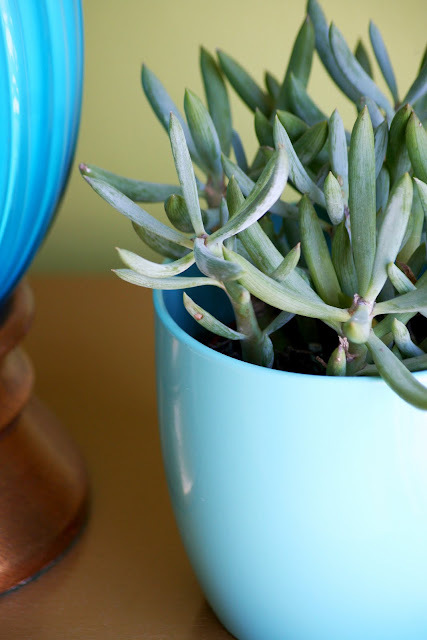 Succulents do well next to our big, sunny window. And, of course, we have to have a stack of vintage books. These are some of my favorite field guides. 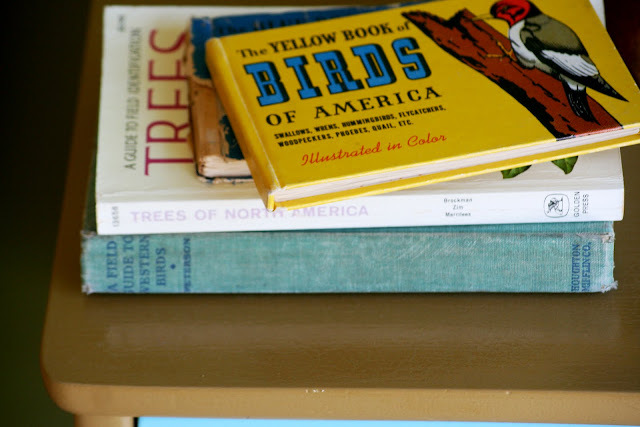 We also always have a rotating stack of children's books on the coffee table. I change them out every week or so for reading time throughout the day. A room without books lacks soul. I squeezed a lot out of this room didn't I? The best part of the room, though, isn't the furniture or even all our treasures that fill it. It's the view of the backyard through those big windows. I can watch the kids climb the avocado tree or swing on the swing. It sold us the moment we walked in that living room. Even if they do let in a lot of heat on summer mornings. We put up with it. I'm not sure if the living room is my favorite room in our house. I really love our kitchen. And our schoolroom/office too. If you haven't done so already, check out the more room tours of our house. The links are on the side bar there. Just click on one to take a peek. I love looking at other people's homes and I love sharing ours with you. i think this is an amazing space. you are true to you, stylish and so very authentic. i love every square inch. and posting with a newborn? so rocking it with four kids. Greta, I'm a beach house girl, but I could get very, very comfortable here in your home! Thanks for sharing! Super cute room. Love that picture of the cute trailer. Are you still in that tiny house? Our house is definitly not that tiny, I think it's 1300 sq ft, but I wanted to keep the office an office and make it an office/playroom. I love your simple style. It looks like you have no clutter and I love that. We have been in our house for a year, and I have like nothing on the walls! If you have any office/playroom ideas throw them at me! I love this living room tour! I just did a tour of my living room yesterday. (Here: http://mymcmlife.wordpress.com/2011/06/21/house-tour-living-room/) Our living room is similarly all vintage, mid-century from thrift stores, estate sales, etc. except for our couch and book shelves. 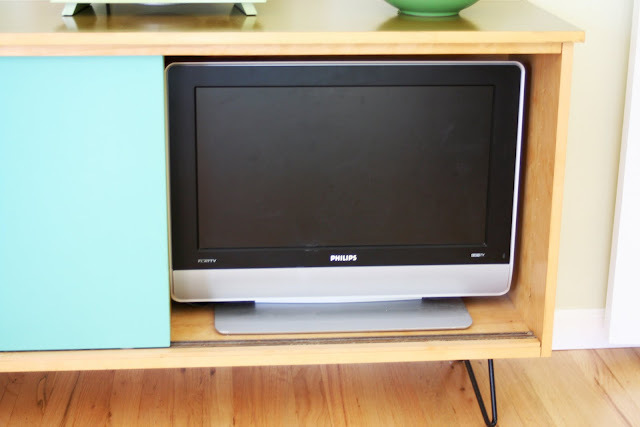 Your beautiful credenza reminded me how much I hate that our TV gets so much showcase in our living room. And we only use it occasionally for movies and Hulu. I was totally inspired to re-explore some of my ideas for how we can hide it. Oh! It is so very inviting. I love every piece, and that your husband added so much to the space. 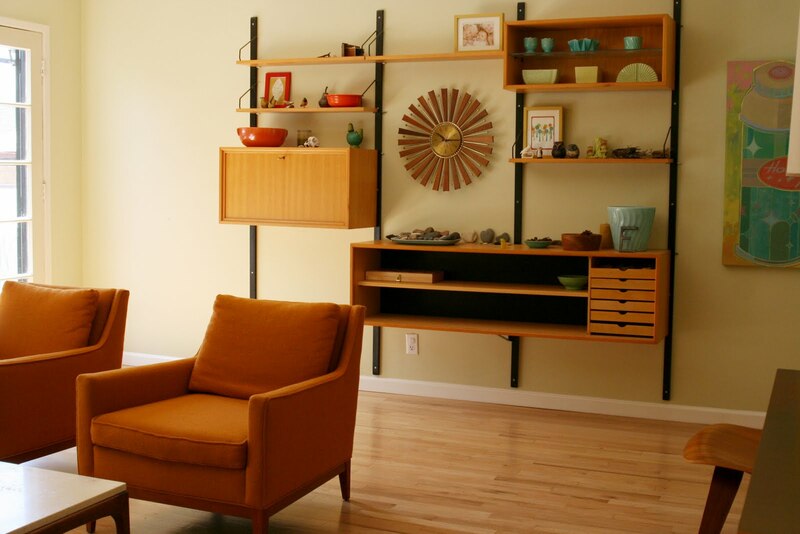 That wall unit is amazing! When I saw it I thought "those little drawers would be perfect for all of our nature items" so it was funny to see that you keep your nature table there! 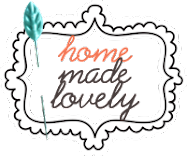 I just discovered your blog and I am in LOVE with your style! In the past year, I've come to realize that mid-century modern is my favorite & I've been slowly trying to change things around our house. Your living room is absolutely amazing! Congrats on the arrival of little Davy! and yes, he is super cute! 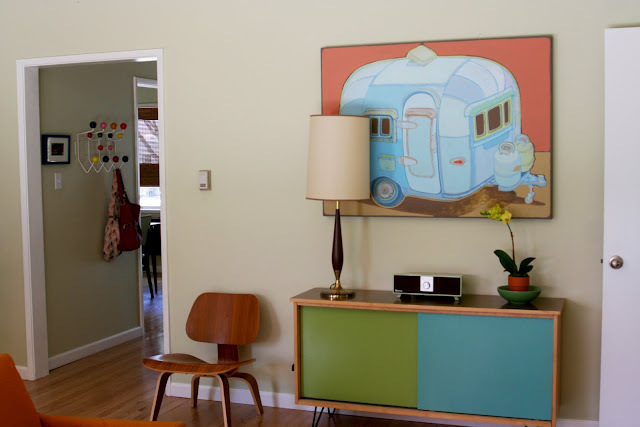 I love mid-century modern, I just have to look in the mirror to see it, LOL Great blog as usual! what a joyful room this is, greta! i love the furniture. mostly the little extras, the owls, art, clock...those are rockin' my socks. the entire room design just shouts COMFY and FUN. Hi! I found you over on Ohdeedoh. This room is as great as your kids'. Would you mind sharing the living room paint colors? They're perfect. P.S. I'm so thrilled to have found your blogs. They're beautiful, as is your family. Hi! I'm visiting via My MCM Life. I'm so glad Martina recommended your blog, and specifically this post! 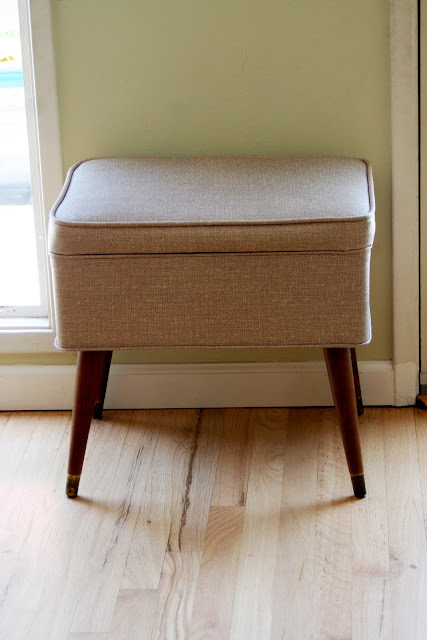 My little home is also full of mostly vintage pieces. I wouldn't have it any other way. And by the way, you're right. 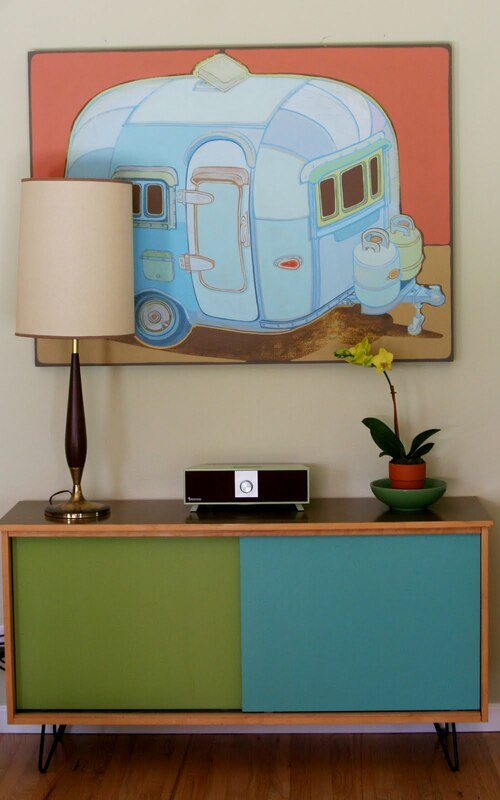 Your husband--and the credenza he designed--is amazing. I'm excited to follow your journey from now on! Hiya, Just found your blog and love it! 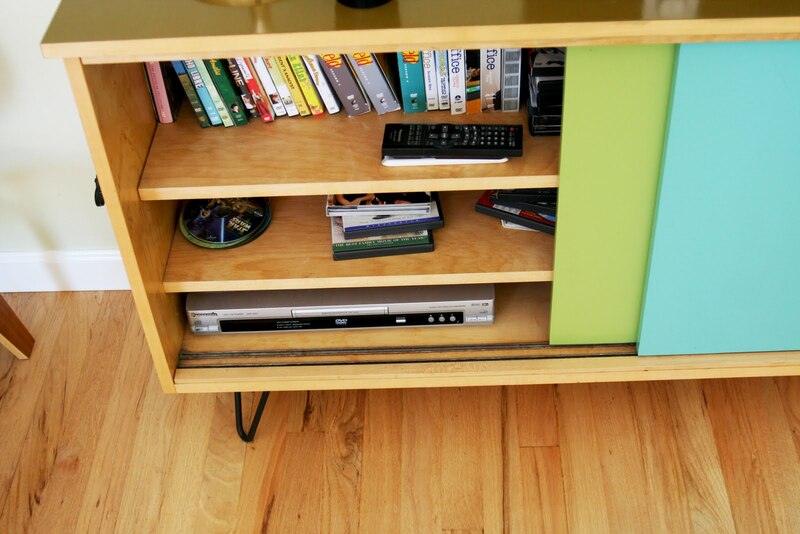 I adore the credenza your hub built. I want something similar for out tv as they are such an eyesore.